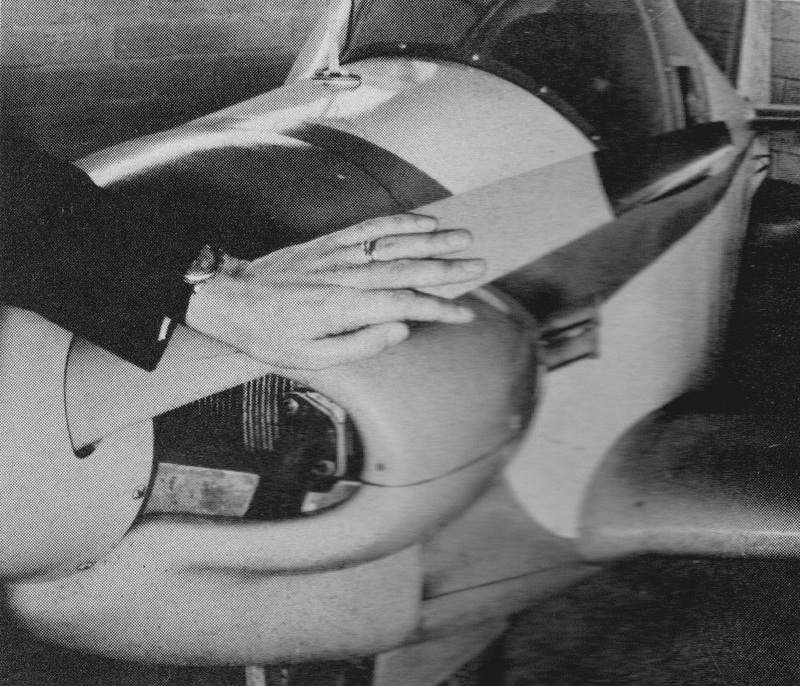 This single-seater low wing motor glider was the first of a series of such types designed by M Rene Fournier to go into production, and to be built by several different companies in France and Germany. The RF3 was developed from the prototype Avion-Planeur, known as the Fournier RF01, which first flew on 6 July 1960. 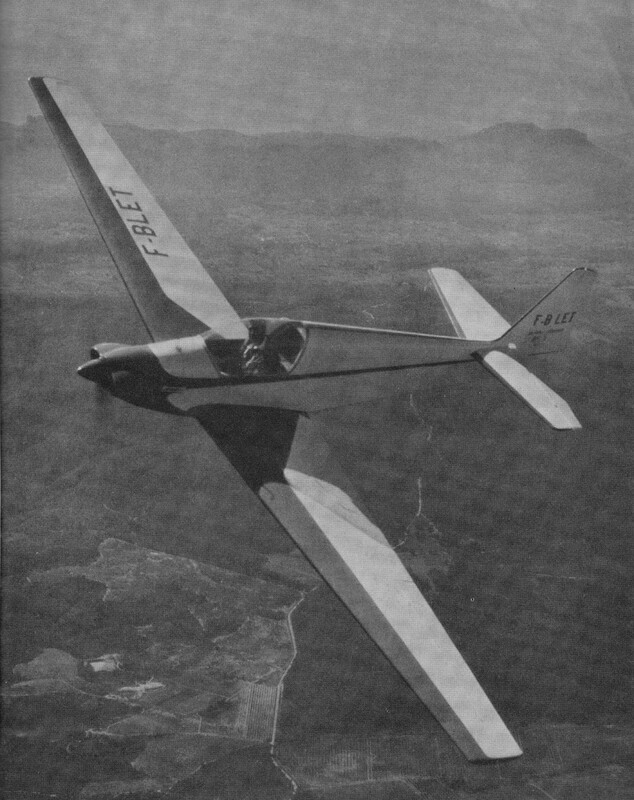 It proved to be so successful that the French Government helped to finance the building of two RF2 pre-production prototypes, the first of which flew in June 1962, and later ordered six of the production version, the RF3, with 34 hp Rectimo-VW engine, for national flying clubs; the first RF3 made its maiden flight in March 1963 and received its Cof A on7 June that year. A second prototype of the RF-01 was built, and then Four­nier entered into partnership with Antoine d'Assche, who was then producing Jodel two-­seaters in a hangar at Gap in the French Alps under the trade name of Alpavia. They pro­duced quite a number of the little airplanes, which were not exactly powered sailplanes but airplanes with an unusually shallow angle of glide; successive improvements brought about the RF4 (the second prototype having been the 2, and the original production ver­sion the 3 with Volkswagen engine). 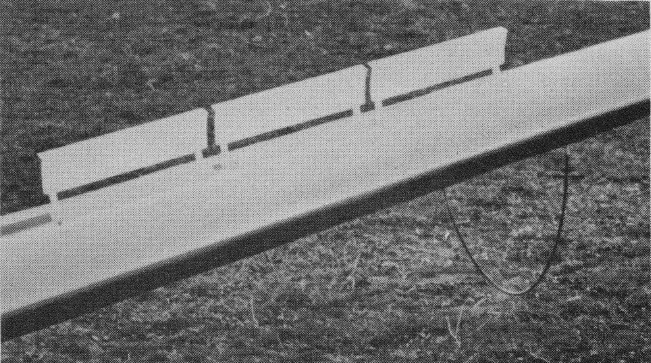 The production RF-3 differed only slightly from the prototype RF-01. The RF-3 is a true airplane-glider and can operate as a conventional airplane, giving very economical ﬂight at low power settings. It can also cruise at higher speeds with very acceptable cross-country performance. The RF-3 also has semi-aerobatic performance both power-on and off. Of all-wood construction, the RF3 has a single spar one-piece wing with D-section leading edge, with 4° dihedral and plywood and fabric covering, attached to the fuselage by four bolts. The ailerons are fabric-covered and there are no flaps, but instead a three-section air brake in the upper surface of each wing inboard of the ailerons. The wooden fuselage, having typical strip longerons, cross-members, spars, ribs, is plywood-covered, fabric covering is used on the rear portion of the wing behind the main spar. Airfoil is NACA 23015 section and aspect ratio is 11:1. The pilot sitting under a moulded one-piece canopy; radio and oxygen equipment are among the optional 'extras'. The monowheel has rubber chord shock absorption and retracts forward manually into a glassfibre cowling; it has a manually-operated brake and is supplemented by a hoop-shaped balancer skid of 6mm steel wire under each wing. The mono-wheel gear gives no problems in maneuvering with ground turning radius about half the wingspan. There is also a steerable tailwheel. Retracting the wheel is by pulling the lever full back and up-lock is automatic. 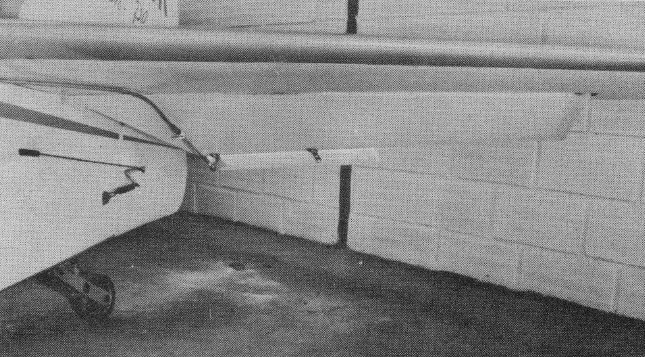 The cantilever wooden tail unit has a trim tab in the rudder. The RF-3 vertical tail has gentle sweep back not employed on previous aircraft in the series. Sailplane type retractable spoilers (speed brakes) are ﬁtted to upper wing surfaces. 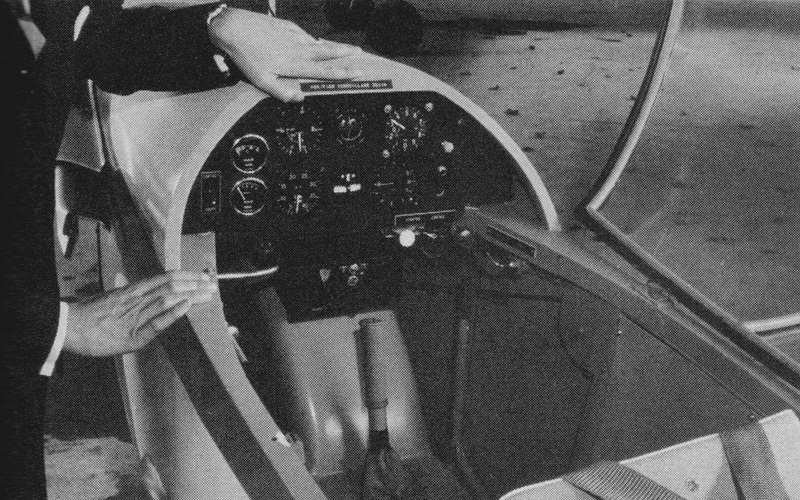 Rene Fournier has designed a comfortable, well laid-out cockpit with excellent pilot visibility. The large Plexiglas canopy is one-piece bubble type with ample head and shoulder-room forward and to the sides. Canopy making was entrusted to a molding specialist able to produce distortion-free surfaces. A sliding window-vent is ﬁtted in canopy left side. The right canopy side is hinged along the top longeron for opening. A strap prevents canopy from ﬂopping completely over against fuselage side. The pilot’s seat has a thick comfortable cushion. Seat back cushions are removable and two back cushions of different thicknesses are available to suit the size and leg reach of any pilot. A small baggage compartment is located behind the seat in the fuselage bulkhead and is accessible from the cockpit. 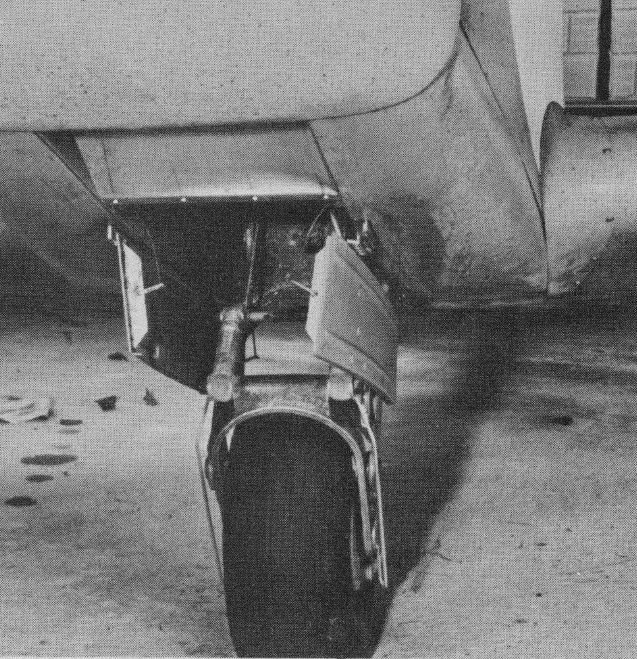 The cockpit ﬂoor has wheel well housing extending upward between the pilot’s legs. Wheel retraction lever is along right cockpit side. Fournier has provided a recess in the left cockpit side for the brake handle when released. This keeps it out of the pilot’s way during ﬂight. Elevator trim tab control is also on right side just below top longeron. Turning to left cockpit side the wing spoiler (speed-brake) actuating lever is located beside the seat and the push-pull throttle is under longeron and panel. The unperforated speed brakes extend 5.75 inches above the upper wing surface and retracts flush with the wing surface. Wheel braking is by hand lever in ﬂoor. Hand brake is of same type used in small French cars. The control stick appears rather short but top is at convenient height so that pilot’s arm rests easily on the leg. Rudder pedals are two wooden bars on which the whole foot rests. The instrument panel, though simple, has all the essentials. Blind ﬂying gyro instruments are not included. A red stall warning light is ﬂashlight battery powered (has test switch) since the RF-3 has neither battery nor generator. Starter and fuel cut-off knobs are at right lower panel edge. Production aircraft have engine cut-off and restarter system installed. This consists of a simple de-compression device which pushes on the exhaust valve rocker arms. With prop windmilling, the engine re-starts easily, even at very low airspeeds. A prop brake is also provided which stops the blades horizontally, covering the cowl air inlets, thus reducing drag to nearly that of a feathered prop. Rene Fournier entered into partnership with Comte Antoine d'Assche of Alpavia SA, which had been building Jodel D117s, and this firm took on the production of the RF3, building a total of 95 in all; deliveries started in November 1963. Alpavia was turning out one RF-3 per week with delivery time of about 8 months in 1964. The RF-3 export price was $4,300 (21,500 Fr.) in 1964. Although the engine can be stopped and restarted in flight and the RF3 is capable of prolonged soaring flights – many such flights of up to five hours have been made – the type should not be regarded as just a powered sailplane, as it has a high performance and is capable of all simple aerobatic manoeuvres such as stall turns, loops, half-rolls, slow rolls and spins. Starting at 97 Knots the RF-3 goes up smoothly for a loop to inverted position at 43 Knots, and gently completes the downward curve to level ﬂight. A hammerhead stall is done at the same starting speed, with near stall speed at the top turn downward. The spilt “S” requires higher starting speed, 113 Knots, for the half-roll. Pull out is at 118 Knots. The slow roll in the RF-3 somewhat difficult to perform well, probably because of the long wing span. The snap roll is easy by comparison. The RF-3 spins with no bad habits. The turning rate is rather slow, but spin recovery is easily achieved. Rudder response is very sensitive and the ailerons produce practically no inverse yaw. The stall characteristics, with stick full back, the stall warning light comes on at about 40 Knots, then at 36 knots the nose drops downward cleanly with a slight left wing low tendency. By simply releasing the stick at the stall, the RF-3 noses down and recovers from the stall on its own. Fuel consumption is an economical low 1.98 gal/hr with cruising speed of 105-mph (91 Knots). This gives 4-hour endurance, without reserve, and a maximum no-wind range of 420 statute miles (364 nautical miles). Allowance for wind would reduce this range to a practical 315 s.mi. (270 n.m.). With economy cruise throttle setting, consumption drops to low-low .77 gal/hr. at 56-mph. If one cared to chug along at this speed, range would be over500 miles—48.6 Knots and over 400 n.m.
Airborne at 48.5 knots after a takeoff roll of a bit over 400-ft. In the pattern at 59 Knots, using the speedbrakes and throttle, unlocking the gear release, the wheel extends under its own weight. Simply push the gear full forward at the end of its travel to lock the gear down. With an approach at 48.5 Knots and, after rounding out, the RF-3 touches down gently with no difficulty at 37.7 Knots. The roll-out is about 300-ft. This performance was soon being proved in service, one notable flight in the winter of 1963-64 being made by an RF3 pilot over St Auban in the Basses-Alpes region, who climbed to 19,700ft after stopping his engine at 6,500ft. Another RF3 was successfully operated in the French Alps with a mono-ski landing gear replacing the retractable monowheel. The engine is a 39hp modified version of the Volkswagen 1,200cc 'flat four' car engine, converted by the Rectimo Co of Chambery. The only modifications are the fitting of a special Zenith carburettor, a propeller shaft and a Bendix magneto of the type used on the 65hp Continental engine. For restarting in flight, an optional mechanical system pushes the four exhaust valves in simultaneously, enabling the propeller to start the engine during a dive at 90mph; a two-blade wooden prop made by Evra or Helice Legere is fitted, and there is a single 6.5 Imp gallon fuel tank in the fuselage. The fuel tank is located between instrument panel and ﬁrewall with a Cub-style internal ﬂoat gauge has graduated wire rod protruding through the ﬁller cap. Pilot has a clear view of this fuel gauge on cowl top.